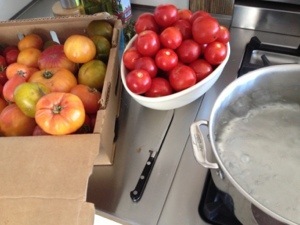 Tomato canning season – get help! Its super exciting to get 24lbs of ripe tomatoes still smelling of sunshine. And the thought of bottling Summer in jars to unlock in the dead of Winter is very motivating. So I plucked what fruit we had from the vines in the greenhouse and asked hubby to drive to mariquita farms nearest drop off for the brightest tomatoes I had seen all Summer. Although its a full Sunday dedication – if you’re tackling it yourself like I did- it’s absolutely worth it. But it’s a lot of work and it doesn’t seem daunting until you’ve finished scoring all the tomatoes, blanched them and then peeled them and its 2 hours later and you still have to stew and then can. How’d that take that long anyway? Reminder to me for the next tomato canning sesh: get help! So 2 hours later, orange fingers and all, you make sure you deseed your ‘maters and the skins are off. Then plop them in a bit pot with some salt and a smudge of sugar. Then stew for 25-30 mins (that’s a light simmer). 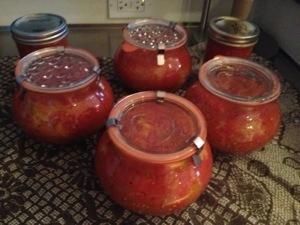 Put 2TBS of fresh squeezed lemon juice in each sterilized quart sized jar and add the stewed tomatoes. Wipe the rims clean and seal them up. Then place the jars in a water bath and boil for 45 mins. Carefully take them out of the bath and let them cool. Check that they’re sealed (I had one not seal so I put it in the fridge for use that week). And then store for your Winter spaghetti sauce and the myriad of other uses.